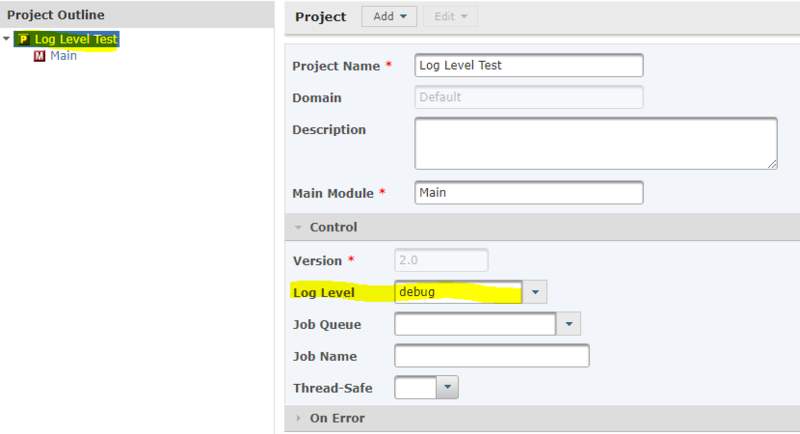 How can I change the log level for my project? Within your project click the P or main project task at the top of the project outline. From there go to the Control section and under Log Level change this to the desired log level. Silent: Logs Project-level information, such as the name of the user that ran the project, when the project started, any variables passed in and when the project stopped. It also logs any errors encountered. Normal: Additionally logs the start and stop times of Modules, Loops and Tasks. Verbose: Additionally logs Task-level details, such as the names of the files that were processed. Debug: Additionally logs detailed debugging information, such as message responses from servers.